The atmosphere is laid back. 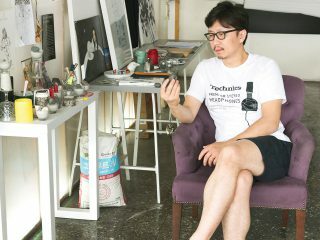 Gone is the ppali ppali, or “hurry up” mood that is so typical of Korean life these days. Instead, people are lounging, cruising the streets on longboards, enjoying a beverage, or getting ready to hit the waves for a surf session. This is Yangyang. 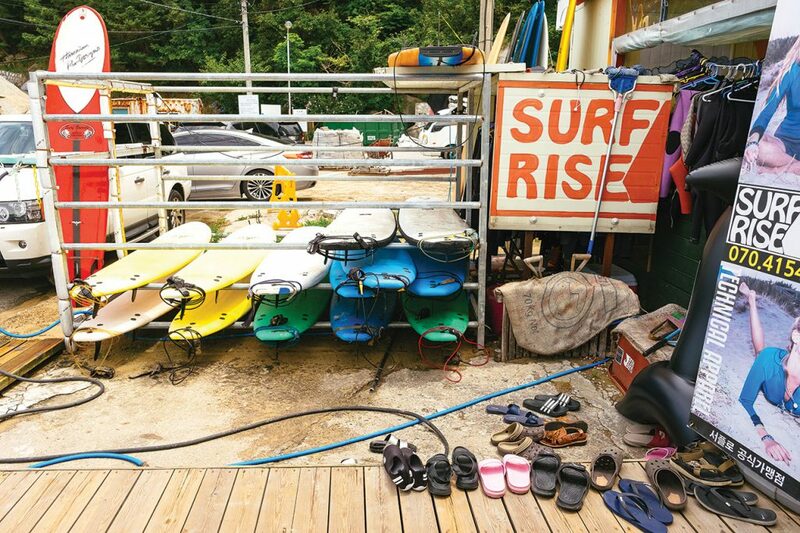 This unassuming fishing and farming area has become one of the hottest surfing destinations in Korea. Yangyang County is located in Gangwondo, in the northeastern part of the South Korean peninsula. With a population of less than 50,000, one would be forgiven for writing it off as a sleepy country town. However, Yangyang is blessed with natural beauty that has made it a popular destination for people from all over the country and the world. 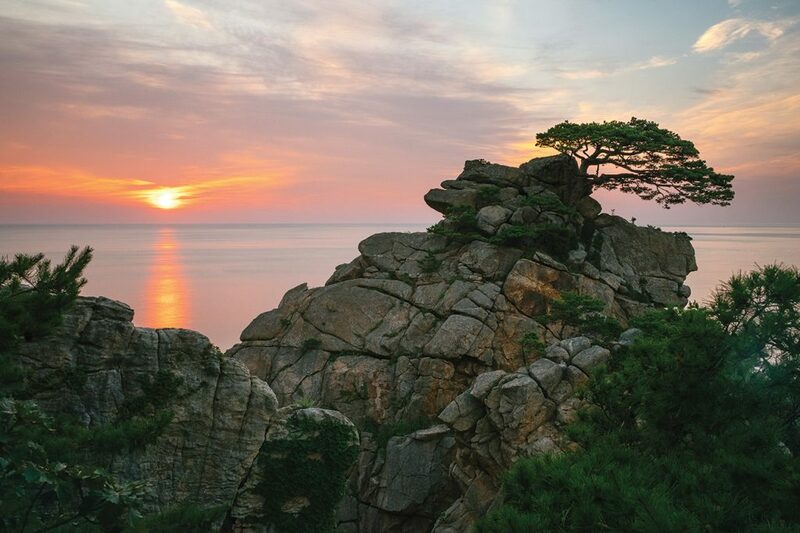 Located on the eastern seaboard right between Gangneung and Sokcho, Yangyang is lined with numerous white sand beaches, picturesque rock formations and sunrise views that the eastern part of the peninsula is so famous for. Jukdo Beach is one the top destinations for surfing in Yangyang. It is said to have the largest number of surf shops in the area. 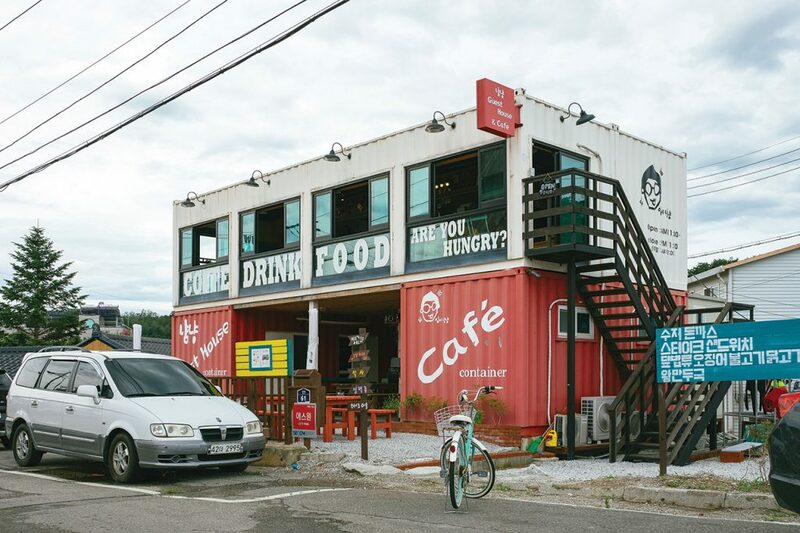 Walking around Jukdo Beach and the adjacent Ingu Beach, you will see colorful buildings, a lot of which are surf shops, guest houses, cafés, pubs or a combination of all these things. It seems that many young entrepreneurs who left the big city looking for a more laid-back lifestyle can be found here. The decor is hip and the crowd is young. This is quite understandable since Seoul is only a couple of hours drive via the Seoul-Yangyang expressway. Crowds of people flock to the coastal town on weekends and holidays to relax and hit the waves. Surfers of all levels can enjoy the waves here. In Yangyang, the waves are mild in the summer, which is great for beginners. Many surf shops offer lessons for those who are just starting out. As the temperatures drop in autumn in winter, the waves pick up and draw more experienced surfers. Yangyang has hosted numerous international surfing festivals over the years, many of which happen in the fall. Before (or after) you go out and hit the waves, visitors can enjoy a wide variety of food and drink in the area. The menus are very western, consisting of burgers, pizza, fries, nachos and other fare quite fitting for the surfer vibe of the area. 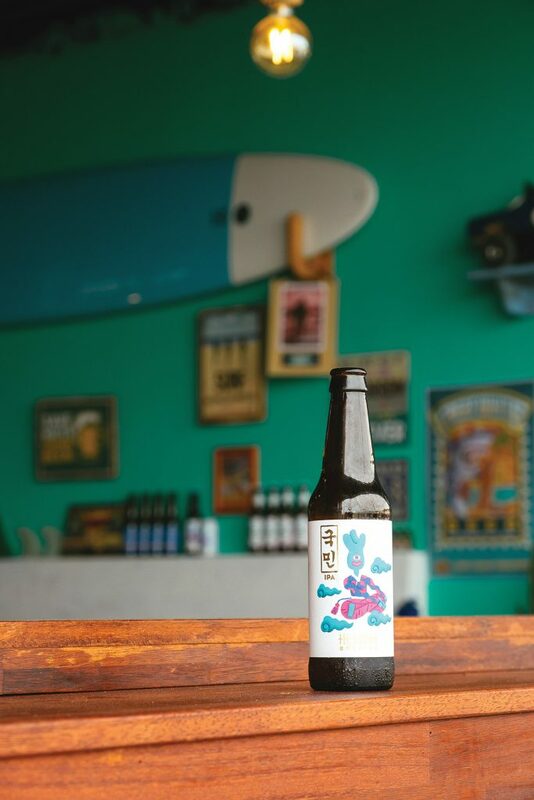 Have a coffee or beer while enjoying beachfront views at Aloha Wave Kitchen and Pub. Or if you are craving craft beer, Yangyang Chemistry offers a wide variety of local brews as well as great bar chow. 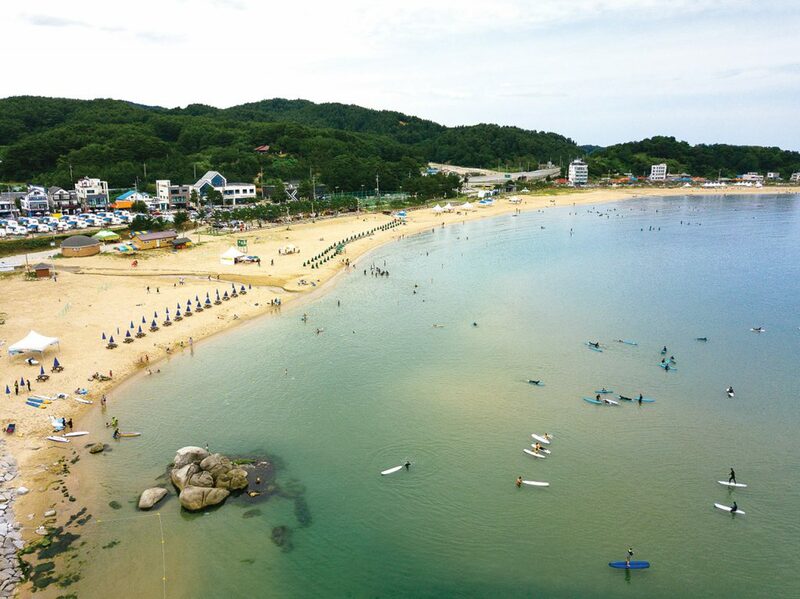 Other popular activities on Jukdo beach include scuba diving, fishing or just enjoying a good swim and barbecue with family and friends. Visitors who are craving a more traditional or spiritual experience will enjoy Naksansa. The 1,300 year old temple was built by Uisang, one of the ancient Silla Kingdom’s greatest monks. The temple is spread out over a large area and houses numerous cultural assets. Noteable assets include a seven-story pagoda, the Hongyaemun Gate and a copper bell. There is also a large stone statue of the Bodhisattva of Mercy, the largest of its kind in East Asia. One of the most picturesque areas of Naksansa Temple is the Uisangdae Pavillon. Built on top of a cliff by the sea, this is the place where Uisang would sit and meditate. Nearby on an opposite cliff is the Hongryeonam Temple. This small temple is built on top of a stone cave through which you can view the ocean below. Naksansa Temple is also a Templestay destination. Participants of this cultural program can experience the life of Buddhist practitioners, from early morning communes with nature, meditation and connecting with your inner voice. 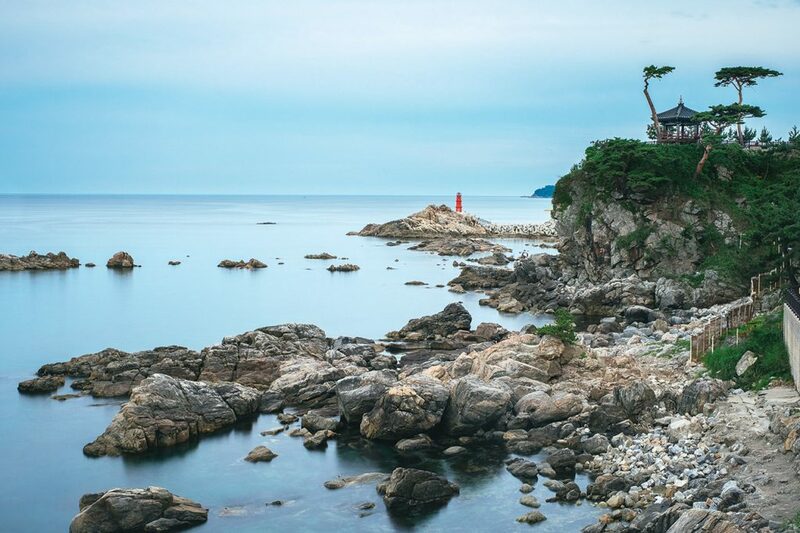 What better place to do this than among the pine trees, seaside cliffs and tranquil surroundings of Naksansa. Yangyang’s position along the eastern seaboard makes it an ideal place to view the sunrise. Photographers and landscape enthusiasts will particularly appreciate the prominent rock formations protruding from the sea. Add the uniquely-shaped pine trees, which are ubiquitous in this area, and you have beautiful landscapes that are reminiscent of ancient Eastern landscape paintings. Hajodae is one of the best places to view such a landscape. Located on the eastern tip of Hajodae Beach, this lookout features a well-known unmanned lighthouse as well as a lone pine tree perched on a cliff. It is the perfect place go for a morning walk and view the sunrise. Yangyang also has other beautiful landscapes located further inland. Micheongeol Valley is a lesser-known, and in effect, a more untouched destination. This valley has a rich forest, clean water and rock formations. There are also numerous ecological parks in Yangyang. These protected areas feature an abundance of trees and plants, which is great for nature walks and exploration. One such park is the Namdaecheon Stream Salmon Ecological Park (남대천연어생태공원). The Namdaecheon stream is considered one of the cleanest in the region, and every year during autumn a large population of salmon return to this area, hence the name. The area has long walking trails, tall grass and a sea breeze that will surely ease the mind. Yangyang has two representative products and an annual festival for each of them. One of these products is salmon. Every year during autumn, 70% of Korea’s salmon population returns to Yangyang. The result is fresh catches of salmon and a wide variety of grilled, fried and raw salmon dishes for people to enjoy. The Yangyang Salmon Festival highlights this with contests, exhibitions, performances and other events. The other representative product of Yangyang is the Pine Mushroom, or Songi. These mushrooms, which grow naturally on the Taebaeksanmaek Mountain Ridge, feature a thick texture and strong scent. Like the salmon festival, the Yangyang Songi Festival also features a wide variety of activities and festivities to celebrate the local delicacy. Visitors can enjoy pine mushroom dishes at several establishments around the area. 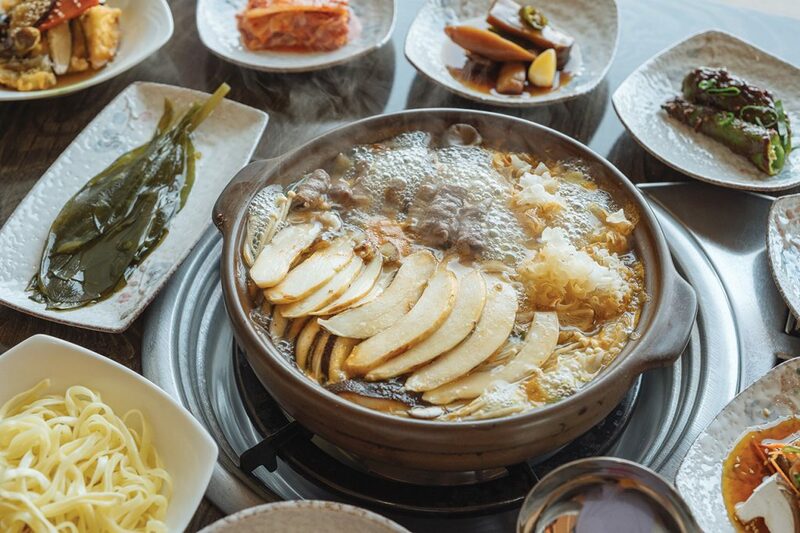 This writer recommends the Songi Mushroom Hotpot at Matsutake Mushroom Town. STAY> Yangyang has a wide variety of accommodation options, from high-end resort hotels, such as the Sol Beach Resort (T. 1588-4888), to motels and pensions. Those going there for surfing might find it most convenient to stay at the guest houses provided by the surf shops in the area. EAT> For seasonal salmon dishes as well as other local fish dishes such as Yangyang’s staple ddugeoritang, check out Cheonseon Restaurant (T. 33-672-5566). For a wide variety of mushroom dishes including the well-known pine mushroom hotpot, visit Matsutake Mushroom Town (T. 33-672-3145). GO> Buses to Yangyang Intercity Terminal depart from Seoul’s Express Bus Terminal or Dong Seoul Bus Terminal (travel time: 2 hours 50 minutes). There is also the Yangyang International Airport (YNY), which also serves the nearby areas of Sokcho, Gangneung and Pyeongchang.